Are you trying to learn more about our products? Or maybe you just need to find a solution to a specific problem? Either way, we’ve got something for you. This blog post is a compilation of all the important sources of information about Piwik PRO. Be sure to check them out! Piwik PRO is a marketing and analytics platform that has gained the trust of a large number of users – including renowned banks, financial institutions, and governments. It provides accurate and unsampled data for businesses of all sizes, including multinational enterprises. However, like every technical tool, from time to time you might need a bit of help managing it. Especially if you’ve just started using it and you’re not sure how to achieve certain goals or gain access to certain metrics. Don’t worry, we’ve got you covered. In addition to providing enterprise-level support for organizations needing secure analytics and marketing tools (we mean Piwik PRO), we generously share our expertise in this area. We write blog posts on best product practices, create ebooks, publish user guides, and conduct webinars. However, we’re aware that all these different pieces of information are scattered around various places. That’s why we’ve decided to make this blog post a centralized base of knowledge for everyone who wants to learn the ropes of Piwik PRO. We hope you’ll find it useful! Here you can find a list of valuable sources of information that will help you take your Piwik PRO skills to the next level. It’s an exhaustive source of all the relevant information about technical aspects of our platforms. 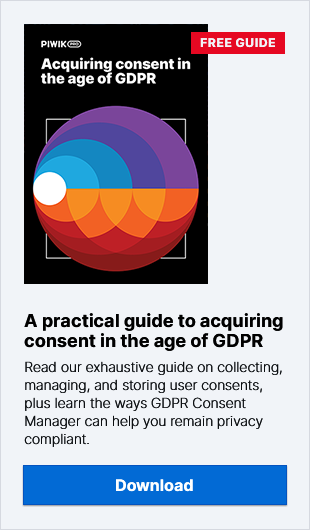 In easy to digest, step-by-step guides, our team explains such issues as connecting Piwik PRO to WordPress, email reports, AdWords integration, GDPR compliance of our products, and a host of other relevant matters. Be sure to check them out! If you’re looking for more in-depth reading, we advise you to visit the “Resources” section on our website. There you’ll find a bunch of infographics, ebooks, and presentation decks covering topics like comparisons of the most popular web analytics and tag management systems, GDPR compliance guidelines, and a lot more. Our company’s blog is also a good source of knowledge about Piwik PRO functionalities. In addition to topics like data security and GDPR, we also discuss issues related to enhancing the tool’s efficiency. Are you interested in optimizing your Piwik instance? If so, this is the blog post for you! You’ll find valuable tips on how to positively impact the performance of your infrastructure, inbuilt settings, database and archiving process. It’s also a definite must-read for everyone considering on-premises deployment of their Piwik platform. Piwik PRO Tag Manager is a highly versatile tool. We write about it on our blog so often that we decided to create a blog post aggregating all the content about PPTM created so far. In there, you’ll find very helpful use cases and applications for the tool that you can duplicate on your own. We hope you’ll like it! When done right, campaign tracking can be one of the most insightful elements of your referrals reports. Having a good system of URL tags in place can deliver valuable insights into your campaign’s performance. So if you’d like to know how to configure it in your web analytics platform, this blog post will help you wrap your head around the most important things you have to do. And that’s it. We hope that the wealth of information we’ve provided in this post will teach you some useful things about Piwik and help you better understand its functions. Also, remember this: if you’re still using the open-source version of Piwik and experiencing recurring problems with the platform that you can’t solve on your own, you can always switch to Piwik PRO. Our dedicated support teams will be happy to help you out with any issue you might face. We’ll provide you with enterprise-level deployment, configuration and Piwik PRO training, so you can get started really using our platform and gain valuable insights into your users’ behavior right away. You’ll also be given a dedicated project coordinator who will answer all your questions and help you get the most out of the tool. What’s more, you’ll receive around-the-clock monitoring of performance, data collection, and backup consistency. Custom SLAs will ensure that all potential issues or system failures are resolved within the agreed timeline. Sounds good? Feel free to contact us whenever you want – we’d love to show you all the benefits that come with using Piwik PRO!